This sophisticated Scuderia Ferrari Orologi watch from the new Abetone family has been designed for the classic sport aficionado. This 42mm model features a rose gold crafted case which is topped by a polished bezel. The dial is signed in script with the name Abetone, with an applied metallic Scudetto and markers, while also featuring a black minute track running from 12-o-clock to 3-o-clock. 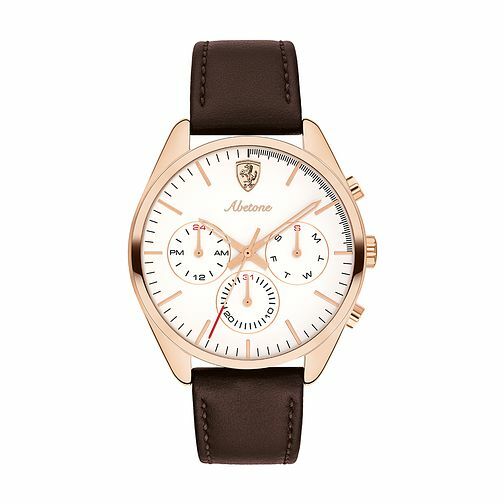 The 3-hand date model features a day/date/24-hour time indication and is offered on a smart, smooth brown leather strap with sewn tonal stitching.